Need some extra pampering right about now? Looking for the perfect product that will ensure pure bliss in less than 20 minutes? Like Love chocolate? If you answered yes to any of those questions, then you simply MUST go immediately to Chocolate Lotus and purchase the Bella Lucce Peruvian Chocolate Renewing Masque! It is the most incredible delicious pampering product I have ever used! A few weeks ago, Chocolate Lotus offered me my choice of products from their impressive selection of natural, organic and luxurious bath, body, skincare and gourmet products. Honestly, I spent hours looking at their inventory and had the most difficult time choosing one product. Finally, I narrowed my wish list to three equally fantastic products: Bella Lucce Peruvian Chocolate Renewing Masque, Bella Lucce Peruvian Chocolate Sugar Scrub, and Serendipity3 Chocolate Peppermint Foot Creme. Kim chose to send me the Masque, and I am so grateful that she did! 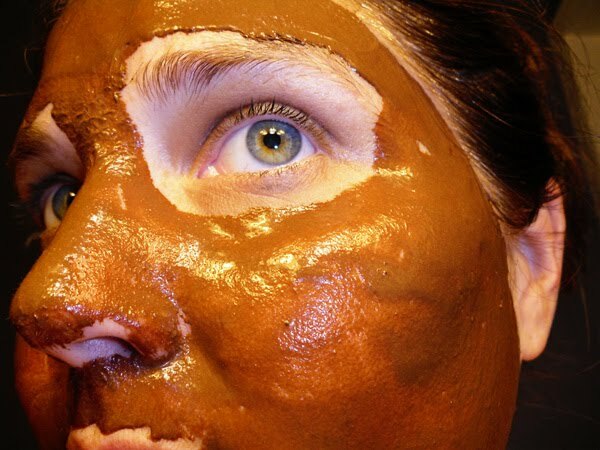 What better way to renew your skin and release your worries than to paint yourself in chocolate? The lactic acid and vitamins in coconut milk combine with pure cocoa powder to create a 100% natural masque for the face, feet and everything in between. Mix it up, paint it on and watch your worries melt! Beautifully gift boxed and accompanied by a spa-quality body brush and a handful of delicious Belgian chocolates embossed with the Bella Luccè signature (chocolates not included during warm summer months). 3 oz jar. A dry masque system designed to restore skin’s suppleness while saturating the tissue with natural antioxidants. Choose a mixer and blend the masque at home in less than 30 seconds. Massage onto skin and allow to remain for 10-15 minutes. Comprehensive mixing directions included. This masque is perfect for chocoholics of any skin type. Why can't you live another minute without it? They say that every cloud has a silver lining, but those fighting the battle against aging may not hold such an optimistic view....until now. You might be surprised to learn that one of your favorite indulgences boasts an amazingly dense concentration of natural antioxidants that help slow the natural aging process by altering the rate at which your skin oxidizes. A recent New York Times article noted that dark chocolate has approximately eight times the antioxidant potential of green tea. Now that's what we call a silver lining! Treat yourself to this natural chocolate mask and rediscover radiant skin. When my package arrived in the mail from Chocolate Lotus, I was in the midst of running errands. Even so, I opened the box and was immediately disappointed that I wouldn't have time right then to test the product. I set it aside for later that evening. 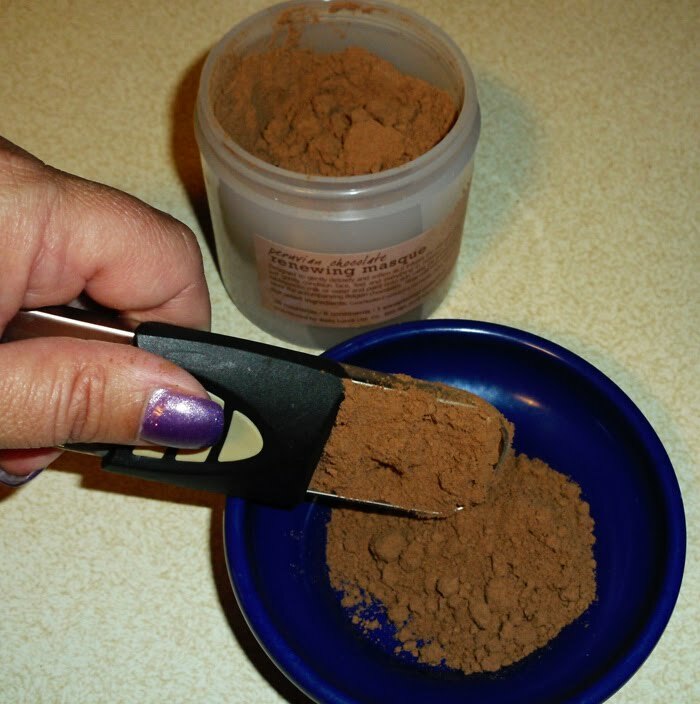 The second time I used the masque, I mixed the powder with milk and used only 1 1/2 tablespoons. This consistency was much easier to work with, even though I still dribbled some on my shirt. :) I found that my face was even softer the second time around. I am not sure if it was because of the milk or continued use of the product. I am going to try it with rice milk next week. 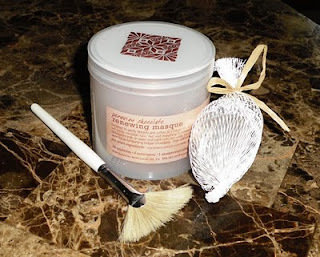 Each time I have used the Bella Lucce Peruvian Chocolate Renewing Masque was sheer bliss! Not only is the product simple to use, but the smell is heavenly! The entire time I paint it on my face, I can't help but think I am smelling brownie batter. I guess that would be my only problem with this product- it leaves me craving brownies! Even so, I intend to use the masque one a week because I absolutely love how it makes my skin feel. I highly recommend Chocolate Lotus for your next shopping splurge of amazing pampering products! As I mentioned earlier, you will find an great selection of natural, organic bath and body products- something for every one on your gift list too! Join the Chocolate Lotus Facebook Fan page if you haven’t already for special sales and promotions at http://www.facebook.com/chocolatelotus as well as follow them on Twitter at http://twitter.com/ChocolateLotus. Win ItChocolate Lotus is very generously giving away a Bella Lucce Peruvian Chocolate Renewing Masque to one VERY lucky living life one day at a time reader. 2. After you sign up, leave a comment here that you have completed the submission. 1. For FIVE extra entries, blog about this giveaway with a link back to living life one day at a time (http://colleenstearns.blogspot.com/) and Chocolate Lotus (be sure to post the url to your post here in a comment so I know where to find it). 6. Follow living life one day at a time and Chocolate Lotus on Twitter AND Tweet about the giveaway. Leave the URL to the Tweet in your comment. You can tweet once a day, but remember to leave the URL to each tweet. You can tweet "I entered to win a great pampering gift from @ChocolateLotus and @livelifereviews. You can too! http://tinyurl.com/27xpy6b #giveaway " Make sure to leave a link to your twitter message in your comment. You can do this once a day. Please make sure to come back each day and leave another comment with your new twitter message link. *Enter by 11 pm (EST) on Wednesday, July 7, 2010. There was no monetary compensation received for this review. I received products from Chocolate Lotus for the purpose of completing this review. Receipt of this did not sway my opinion. I signed up for the Chocolate Lotus email list. I'm subscribed to your blog feed via email. I'm following your blog publicly via GFC under A Lil' Of This A Lil' Of That. I just signed up, hope I win! I signed up on their website! I am following both on Twitter and I tweeted. I completed the sign up for the chocolate Lotus ! Public follower through Google Friend Connect. I signed up for the e-mail list. I signed up for the Chocolate Lotus email list!